Tuesday, January 16th, marks our first day back from the holidays. 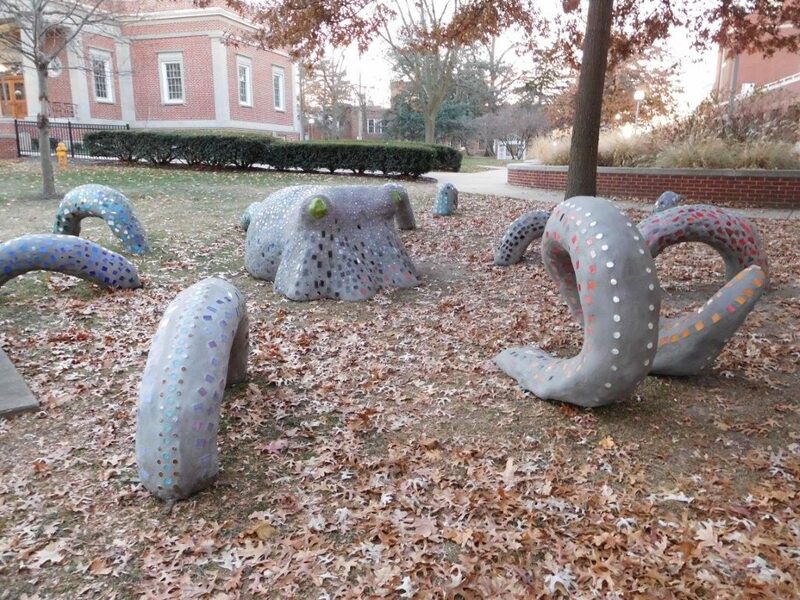 To celebrate your return, you can now go octopus hunting on the quad! When you walk around campus on your way between classes be sure to check out the latest installation from Danielle Yakle’s Introduction to the Visual Arts class. 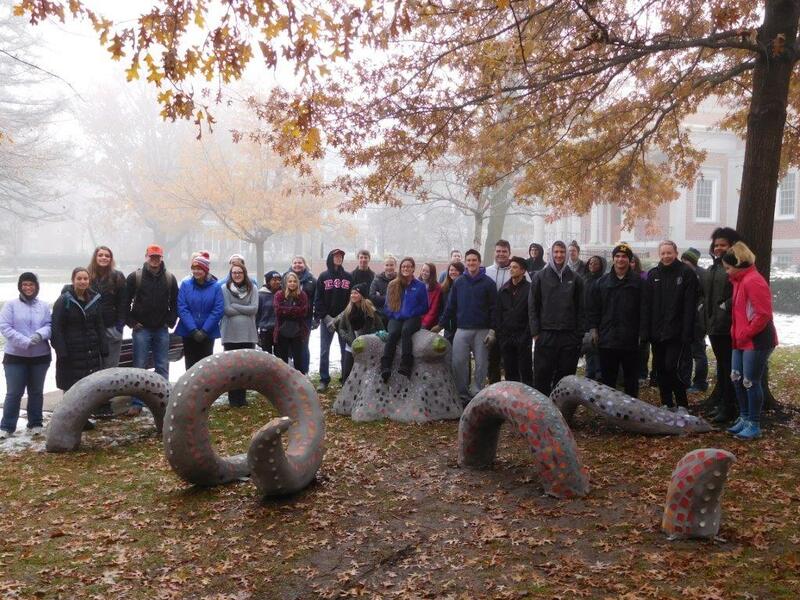 Students in Danielle Yakle’s Fall 2016 Intro to the Visual Arts class with their installation outside the library. All photos courtesy of Atticus Bailey. One of several acorns on Truman’s campus. These were a project in Danielle Yakle’s Introduction to Visual Arts class, Fall 2015. Photo courtesy of Tim Barcus. After studying some public sculpture the students proposed ideas for a piece they could construct and install in Kirksville. 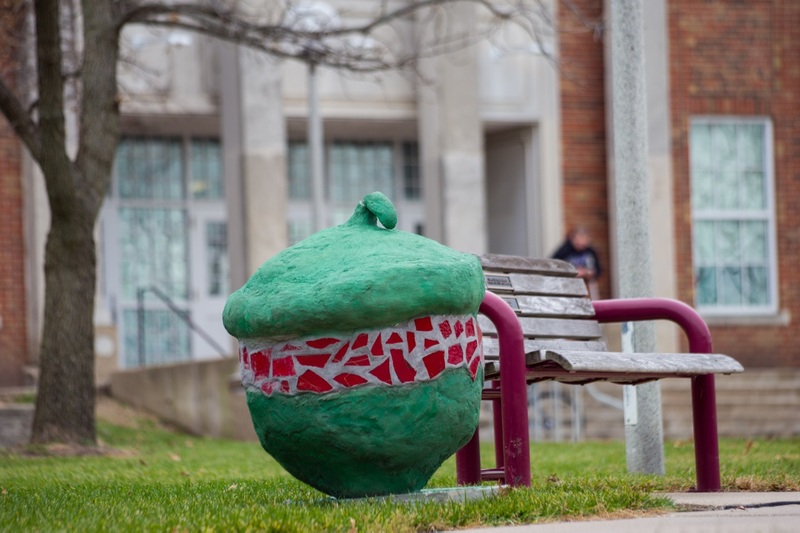 The winning idea was a series of acorn sculptures that would be spread throughout campus. The students chose the form of an acorn both as a sign of the fall season and to celebrate the student body’s fascination with our local squirrel population. 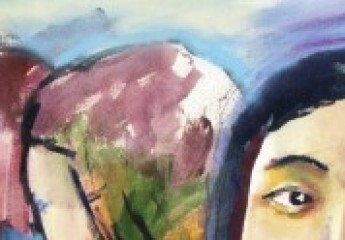 The project is intended to be lighthearted and to inspire a scavenger hunt-like response. 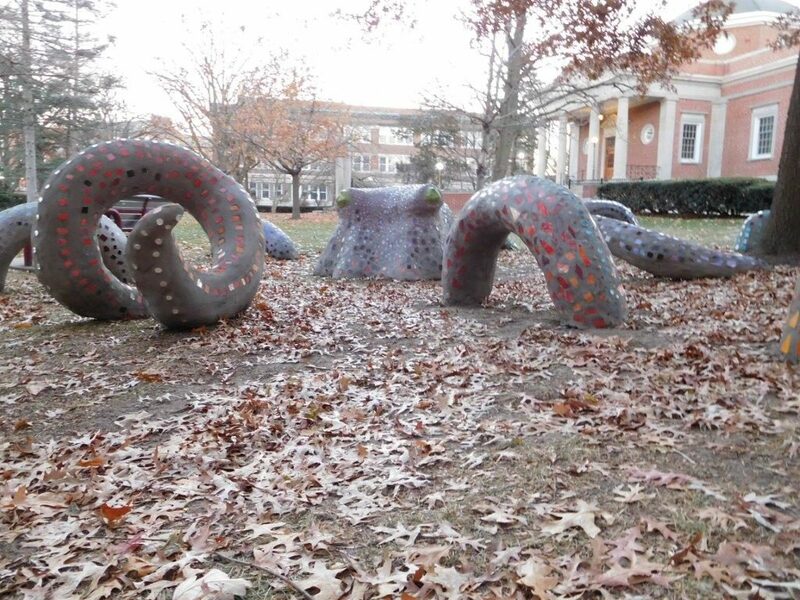 We spread the sculptures throughout the campus, encouraging viewers to explore areas beyond their usual commutes and enjoy finding the pieces unexpectedly as they go about their day. 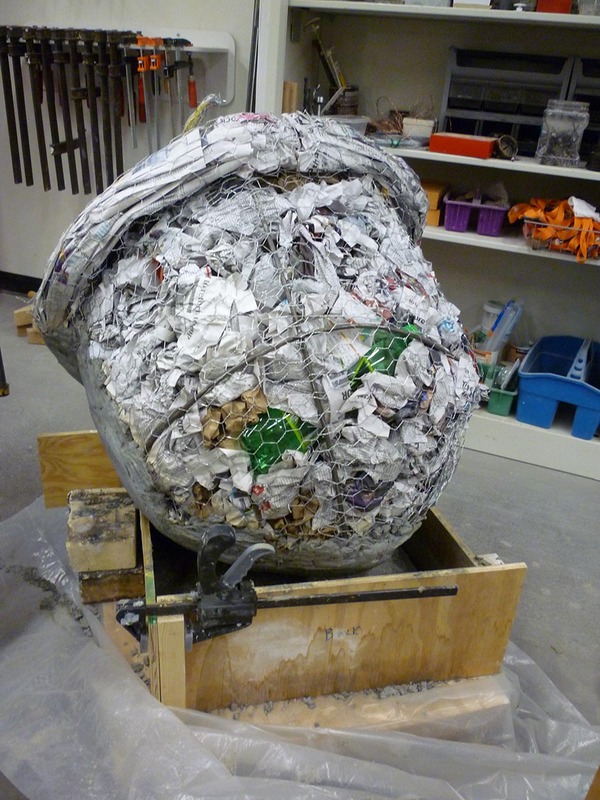 An acorn sculpture in progress, showing the armature and fill before the concrete was added. Even with the lightweight center the sculptures required several people to move each of them. Each acorn sculpture is between two and three feet tall and attached to a small plinth. They are constructed with a welded steel frame covered in concrete and embellished with glass mosaic and paint. Each of the eight acorns has a specific theme and color scheme designed by its student group. While the acorns’ hollow interior helps reduce the weight of each piece, we still estimate that the sculptures weigh between 200 and 250 pounds. Take a look around campus and see how many of them you can find. 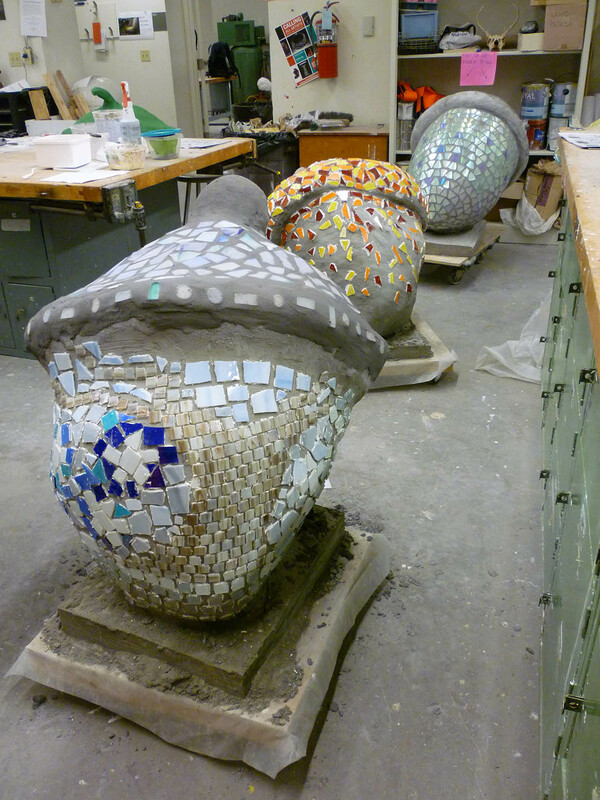 Acorns waiting to get their final touches before being placed around campus. 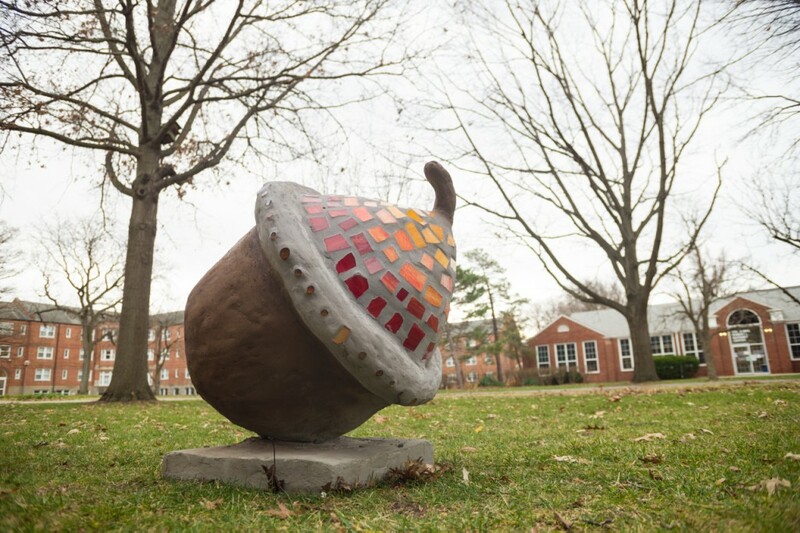 This acorn greets students as they walk from up the path to Violette Hall. Photo courtesy of Tim Barcus.